The NRF Plate Heat exchanger has today become a standard component in the cooling system of many marine application designs. Our plate heat exchangers are characterized by high quality, low costs and a comprehensive plate program, which means that we can deliver the optimal solution to any thermal task. Our product range covers connections from DN25 to DN650 (1″ to 26″) and a liquid flow range from 50 l/hour to 7,200 m3/hour (0.22 gpm to 31,700 gpm). The unique inlet designs and plate patterns ensures a high thermal efficiency and heat transmittance for any given pressure drop. The brazed plate heat exchangers consist of a number of thin acid-resistant precision stamped stainless steel plates with copper brazed gaskets. The plate packs are brazed with two end plates and connections. Vacuum brazing at extremely high temperatures provides a permanently sealed heat exchanger. The final result is a strong and compact plate heat exchanger with extremely high heat transfer capability. 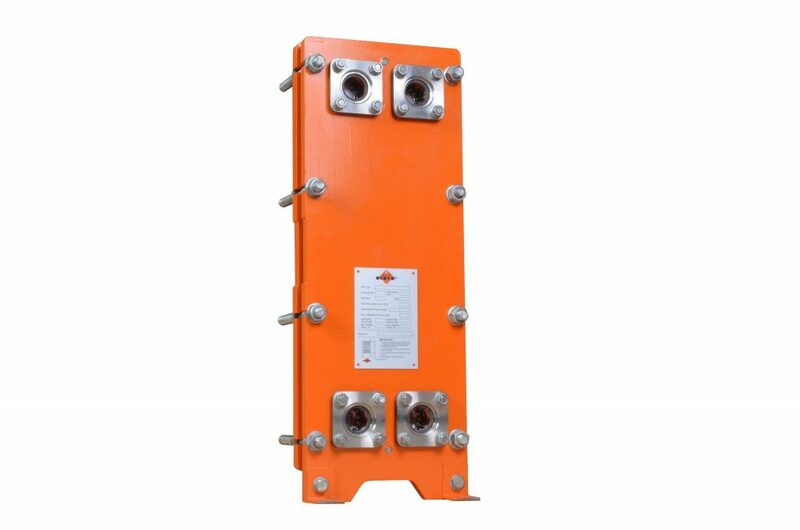 The brazed heat exchangers will cover many duties, up to 150 m3/h (661 gpm) in a single pass solution, where all 4 connections are on the front side. This means easy pipe and service work. Connections range from 3/4” thread BSP/NPT to DN150 (6”).